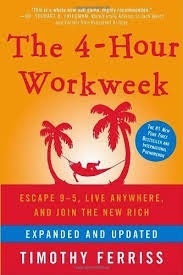 Author Timothy Ferriss claims to have discovered the way to become one of the New Rich without being tied to a regular, 9 to 5 job in the book The 4-Hour Workweek. Most people have accepted the concept of deferred reward, and therefore spend 30 plus years in jobs they hate with people they dislike all for the promised reward of retirement. If you follow the guidelines he sets out, you can begin enjoying your life now, rather than just gritting your teeth for the next few decades. The mainstay of his plan is the DEAL process. Definition, Elimination, Automation and Location are the 4 pillars of this guide. By realizing what you want, avoiding that you don't, and automating your "cash flow," you can live anywhere and still reap the rewards. Of course, everyone will want to know how to live on working so few hours per week. The answer seems to be outsourcing. Ferriss's first big foray into the business world was a "sports nutrition company" where he "outsourced everything from manufacturing to ad design." That seems to be a very risky thing to do -- not just financially, but how can you ensure what is in the product (especially if it's being manufactured overseas) when you seemingly have no control of supervision over how it's made? Even though he avoided (apparently) any lawsuits or other disasters, he was so stressed by running the business full-time that he sold it and looked for a better way to make a living. There are plenty of websites included to help you achieve each of the 4 parts of the DEAL process, as well as worksheets and examples to help you follow the plan. Some of the advice is familiar: you'll be more likely to shake off problems and obstacles if you are working in a field you love; failure should be seen as an opportunity to go in another (possibly more lucrative) direction; don't settle for something you don't feel passionate about, etc. There is also a lot of what seems to be filler at the end -- posts from the author's blog, "case studies" (people who have followed this plan) and "bonus" chapters of two of the author's other books. Still, for those who are very motivated to escape the daily grind, this book has lots of suggestions that might help to do that.